Introducing Bamboo, the latest arrival in the family of designer globes. Awareness of and respect for our planet inspired its creation. Bamboo would like to be a signal, an emblem highlighting how beauty can be synonymous with environmental friendliness. Bamboo grows abundantly at minimal cost without need of expensive fertilizers. It’s resistant and absorbs great quantities of C02. 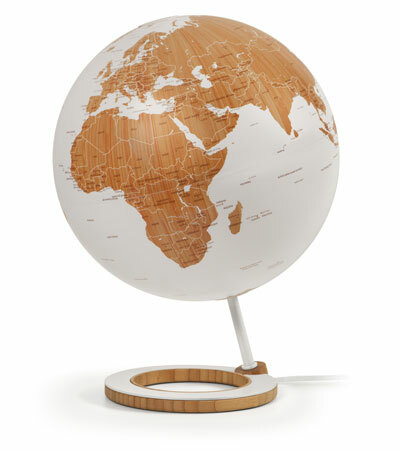 The Bamboo globe, naturally elegant, comes in a 25 cm sphere featuring the latest in cartography the surface of which recalls its bamboo origins. The circular base is in bamboo and the painted steel rod gives it a natural tilt. Not only an object of design, the bamboo globe comes complete with a light-bulb inside and can be used as a lamp. From the same family and adhering to the same philosophy, you can find Bamboo desk accessories for sale as well.Designed by top Danish designer Kristoffer Zeuthen, they are noted for elegance, functionalism and eco-friendliness. They are made of bamboo and painted metal.